The fact that the mountain region of the Prefecture of Larissa was first inhabited about 100.000 years ago accounts for the wealth of its history. Dolihi, Azoros, Dodoni, Kifos, Iloni, Olosson, Hiretie, Gouni, Mallia were some of the prosperous towns founded in the region. The Perevians were the first inhabitants of the region. They dominated over the region and assumed the political administration of Larissa. A large number of archaeological finds reveal the rich cultural heritage of the region. Hippocrates’tomb, the father of modern medicine, came to light after an overflow of the PiniosRiver in 1826. The First Ancient Theatre of Larissa was built on the slope of Frourio hill (or “Fortress hill”), on the south side of the Acropolis and accommodated 10.000 persons. It was connected to ancient Larissa, through passageways & public entrances which linked to the city’s processional ways. According to inscriptions, the construction dates back to the early 3rd century BC during the reign of King Philip V of Macedonia. During the first centuries, the theatre hosted both theatrical performances and assemblies of the senior regional authority. At the end of the first century BC it was transformed into a Roman arena and stayed in use until the late third century AD. 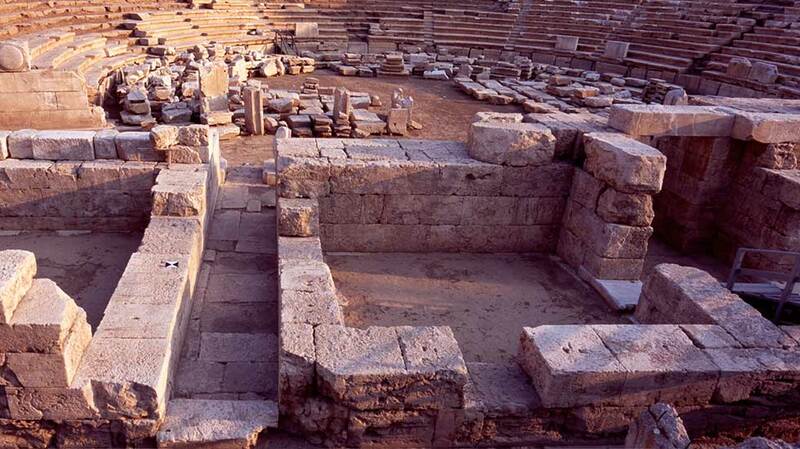 Theatrical performances and other events took place in the town’s Second Ancient Theatre. Excavations began in 1910 but it was not until 1981 that full excavations could be made due to buildings above the site.